When young robotics genius Hiro Hamada gets to visit the school where his his brilliant brother Tadashi studies, and meets his friends: adrenaline junkie Go Go Tamago, neatnik Wasabi, chemistry whiz Honey Lemon and fanboy Fred, he wants to join them. Just as Hiro impresses the head of the school with his invention, a fire breaks out in the building and Tadashi goes back inside. 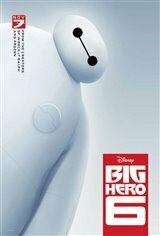 When that leads to a dangerous plot unfolding in the streets of San Fransokyo, Hiro turns to his brother's invention—a robot named Baymax who can heal people—and transforms him into a warrior. Hiro and his new friends transform into a band of high-tech heroes who are determined to solve the mystery. Inspired by the Marvel comics of the same name.